On the topic of crop circles: I don't know. I guess anything I write will be total speculation, being that I have not seen anything but images on TV and heard nothing but others' best guesses about these mysterious formations. So I'll add to the hunchery, presenting nothing new or exciting. There are several theories out there about the formation of crop circles, none of them overwhelmingly proven or accepted so far. Some believe the detailed geometric shapes are resultant of plasma vortices. I'll pause a moment here for effect so this wise and brilliant scientific theory can really sink in... "plasma vortices, plasma vortices, plasma vortices..." If I could represent uncontrollable laughter here in this blog, surely now would be the time to let loose! There's no need to explain this theory, for its name is suggestive enough of the foolery. To believe that some sort of naturally occurring energy field can produce geometric shapes connected by bars and arches of various size, none ragged or interrupted by imperfection, is totally ridiculous. Perhaps the simple circles could be explained by some natural phenomenon, but the arrays of complex geometric shapes are far beyond any natural means of production. Nothing more needs to be said. These are probably the same scientists who believe the entire ordered universe snapped, expanded and whirled into existence by the will of zippo the nonexistent man (by no one's will). The sheer art and organization of the universe and crop circles alike scream of a creator or designer. In the case of the universe, God. Crop circles? Who knows. 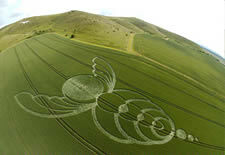 Another commonly held belief is that crop circles are the mark of hovering or landed UFOs. Though I have the general belief that no intelligent life exists outside planet earth (besides the divine or devious), this alien theory holds some water, simply because it involves the thought that intelligent beings created the designs. I see no other option than to bet on intelligence and purpose due to the designs' complexity. There are no other cognitive life forms on this earth besides man, so this intelligence must be either extraterrestrial, divine or none other than human. The last and most popular explanation for crop circles involves what is termed a hoax. Some very clever jokesters get up late in the night and form the designs using crude tools. While this conclusion satisfies my critical mind, I don't immediately assume it to be true. The reports and widespread discovery of crop circles in various places around the world seems odd for a few late night humorists. It is especially baffling that there are few if any concrete sightings of people doing this in the middle of the night. In other words, no one has been caught. This seems unlikely after the discovery of some 2000 crop circles worldwide over at least several decades. 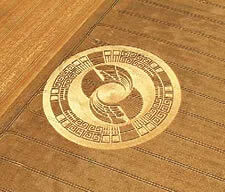 At the same time, there are many crop circles that are indeed fabricated by humans because I found some in my search. Because of the mystery of the forms, many have tried to recreate them with some success. So it is very feasible that they are all of human origin. In the end crop circles remain an interesting mystery in my mind, and I don't have a firm conclusion about their origin. While lights in the sky don't fascinate me, I would be interested to see any solid news about crop circles so my mind doesn't get full of pointless conjecture. If anyone knows of a credible and reliable source or unveiling of this mystery, feel free to email me. Oh, and speaking of crop circles, I was out walking around in the wilderness the other day and came across a very bizarre and coincidental sign. It's not a crop circle, but rather a large metallic object. I took a picture so you wouldn't think I was just making it up. Click here to see. If you like it, feel free to use it as a wallpaper or something, just as long as you point people my way when asked where you got it or what it means!